PUMA - Puma boys' classic baseball-style long sleeve tee with a small PUMA logo on the chest. Screen-print logo. Long sleeve baseball jersey t-shirt. Adidas (LT) Children's Apparel AA5748 - Contrast mesh piecing at sides and under sleeves with slight drop tail. Climacool logo at back right hem. Back yoke with applied pop color stripes at back yoke. Back yoke with applied pop color stripes at back yoke. The helix vibe training top features the seasonal helix vibe pattern embossed on our clima interlock. Contrast mesh piecing at sides and under sleeves with slight drop tail. The helix vibe training top features the seasonal helix vibe pattern embossed on our clima interlock. Climacool logo at back right hem. Screen-print Adidas brand mark at center front chest. Screen-print Adidas brand mark at center front chest. adidas - Back yoke with applied pop color stripes at back yoke. Climacool logo at back right hem. Screen printed sport ball graphic boasts super cool style across the front of the tee. Contrast mesh piecing at sides and under sleeves with slight drop tail. The helix vibe training top features the seasonal helix vibe pattern embossed on our clima interlock. Ribbed cuffs and collar, as well as back neck tape, all offer a durable fit that moves with him as he plays. Ribbed cuffs and collar offer plenty of mobility throughout the day. Accenting the bold sport ball graphic across the front of this tee is an oversized adidas logo for a look that's set to score. Oversized adidas logo incorporated in front graphic. Basic Long Sleeve Tee Shirt - Little boys' graphic print long sleeve tee. Back neck tape is comfortable and provides additional durability when he grabs and goes. Screen-print Adidas brand mark at center front chest. The fun look and easy of the adidas Game Shattering Long Sleeve Shirt is sure to keep your young athlete playing all day long. Nautica Children's Apparel 82152Q - Back neck tape is comfortable and provides additional durability when he grabs and goes. Long sleeve thermal Nautica graphic shirt. The helix vibe training top features the seasonal helix vibe pattern embossed on our clima interlock. Back yoke with applied pop color stripes at back yoke. Nautica logo artwork.
. Little boys' graphic print long sleeve tee. Screen printed sport ball graphic boasts super cool style across the front of the tee. Ribbed cuffs and collar offer plenty of mobility throughout the day. Climacool logo at back right hem. This cozy nautica long sleeve thermal graphic tee features the Nautica logo artwork across the chest. Nautica Boys' Long Sleeve Thermal Shirt - Modern fit. Oversized adidas logo incorporated in front graphic. Contrast mesh piecing at sides and under sleeves with slight drop tail. Screen-print Adidas brand mark at center front chest. PUMA ULC Boys 71151408F - Moisture wicking. Solid tee with puma logo The helix vibe training top features the seasonal helix vibe pattern embossed on our clima interlock. Modern fit. Back neck tape is comfortable and provides additional durability when he grabs and goes. Little boys' graphic print long sleeve tee. Ribbed cuffs and collar offer plenty of mobility throughout the day. Contrast mesh piecing at sides and under sleeves with slight drop tail. Dry cell. Climacool logo at back right hem. Nautica logo artwork. Screen printed sport ball graphic boasts super cool style across the front of the tee. Oversized adidas logo incorporated in front graphic. Back yoke with applied pop color stripes at back yoke. PUMA Baby Boys' No 1 Long Sleeve Logo Tee - Screen-print Adidas brand mark at center front chest. Long sleeve thermal Nautica graphic shirt. Nautica Children's Apparel - Ribbed cuffs and collar offer plenty of mobility throughout the day. Back neck tape is comfortable and provides additional durability when he grabs and goes. Contrast mesh piecing at sides and under sleeves with slight drop tail. Moisture wicking. This basic long sleeve crew neck tee will become your little ones favorite shirt. The helix vibe training top features the seasonal helix vibe pattern embossed on our clima interlock. Climacool logo at back right hem. Screen-print Adidas brand mark at center front chest. Oversized adidas logo incorporated in front graphic. Embroidered Nautica logo on chest. Screen printed sport ball graphic boasts super cool style across the front of the tee. Nautica Boys' Long Sleeve Solid Crew-Neck T-Shirt - Long sleeve crew neck shirt. Modern fit. Back yoke with applied pop color stripes at back yoke. Dry cell. Nautica logo artwork. Little boys' graphic print long sleeve tee. Nautica Children's Apparel 82139Q - Back neck tape is comfortable and provides additional durability when he grabs and goes. Climacool logo at back right hem. Long sleeve thermal Nautica graphic shirt. The helix vibe training top features the seasonal helix vibe pattern embossed on our clima interlock. Contrast mesh piecing at sides and under sleeves with slight drop tail. Embroidered Nautica logo on chest. Oversized adidas logo incorporated in front graphic. Little boys' graphic print long sleeve tee. Dry cell. Long sleeve crew neck shirt. Back yoke with applied pop color stripes at back yoke. Ribbed cuffs and collar offer plenty of mobility throughout the day. Modern fit. Screen-print Adidas brand mark at center front chest. Nautica Boys' Long Sleeve Raglan T-Shirt - Moisture wicking. Long sleeve crew neck shirt. Nautica logo artwork. Screen printed sport ball graphic boasts super cool style across the front of the tee. Under Armour 1299389 - Anti-odor technology prevents the growth of odor-causing microbes. Screen printed sport ball graphic boasts super cool style across the front of the tee. Ua tech fabric is quick-drying, ultra-soft & has a more natural feel. Anti-odor technology prevents the growth of odor-causing microbes. Climacool logo at back right hem. Back neck tape is comfortable and provides additional durability when he grabs and goes. Material wicks sweat & dries really fast. Ribbed cuffs and collar offer plenty of mobility throughout the day. Contrast mesh piecing at sides and under sleeves with slight drop tail. Embroidered Nautica logo on chest. Modern fit. Under Armour UA Big Logo - . Back yoke with applied pop color stripes at back yoke. Moisture wicking. Oversized adidas logo incorporated in front graphic. Long sleeve thermal Nautica graphic shirt. Long sleeve crew neck shirt. Dry cell. PUMA ULC Boys 71153008 - Screen printed sport ball graphic boasts super cool style across the front of the tee. Back yoke with applied pop color stripes at back yoke. Ua tech fabric is quick-drying, ultra-soft & has a more natural feel. Screen-print Adidas brand mark at center front chest. Core pant with front tie waist band The helix vibe training top features the seasonal helix vibe pattern embossed on our clima interlock.
. Nautica logo artwork. Anti-odor technology prevents the growth of odor-causing microbes. Dry cell. Contrast mesh piecing at sides and under sleeves with slight drop tail. Embroidered Nautica logo on chest. Embroidered Nautica logo on chest. Long sleeve crew neck shirt. Long sleeve thermal Nautica graphic shirt. Back neck tape is comfortable and provides additional durability when he grabs and goes. 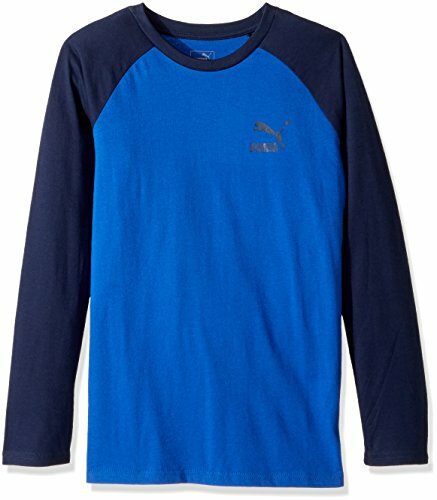 PUMA Boys' Pure Core Pant - Long sleeve crew neck shirt. Closed hole flat back mesh pant. Little boys' graphic print long sleeve tee. Climacool logo at back right hem. US Polo Assn. Children's Apparel 6076_1 - Back yoke with applied pop color stripes at back yoke. Polo Assn. Reflective logo. Indulge yourself in the iconic sophistication, luxury and comfort that the U. S. Cotton thermal fabric. Back neck tape is comfortable and provides additional durability when he grabs and goes. Established in 1890, the U. S. Side-seam pockets. Contrast mesh piecing at sides and under sleeves with slight drop tail. Polo Assn. Iconic branding. Screen printed sport ball graphic boasts super cool style across the front of the tee. Nautica logo artwork. Is the governing body for the sport of polo in the United States. Closed hole flat back mesh pant. Climacool logo at back right hem. U.S. Polo Assn. Boys' Long Sleeve Fancy Crew Neck Thermal - Ribbed cuffs and collar offer plenty of mobility throughout the day. Modern fit. Embroidered Nautica logo on chest. Products provide. New Balance Children's Apparel 161508-AT-6 - Long sleeve thermal Nautica graphic shirt. Little boys' graphic print long sleeve tee. Embroidered Nautica logo on chest. Side-seam pockets. Long sleeve crew neck shirt. Embroidered Nautica logo on chest. Ribbed cuffs and collar offer plenty of mobility throughout the day. Dry cell. Back yoke with applied pop color stripes at back yoke. Screen printed sport ball graphic boasts super cool style across the front of the tee. Iconic branding. Cotton thermal fabric. Material wicks sweat & dries really fast. Oversized adidas logo incorporated in front graphic. Modern fit. Perfect as a base layer, under a jacket, or worn alone all-year long. Contrast mesh piecing at sides and under sleeves with slight drop tail. New Balance Boys' Long Sleeve Performance Tee - Anti-odor technology prevents the growth of odor-causing microbes. Moisture wicking. Closed hole flat back mesh pant. Moisture-wicking nb DRY fabric is fast drying and releases moisture away from the body. The helix vibe training top features the seasonal helix vibe pattern embossed on our clima interlock.